110 Beacon is located on the north side of Beacon, between Arlington and Berkeley, with 108 Beacon to the east and 112 Beacon to the west. 110 Beacon was built ca. 1856. It was originally numbered 105 Beacon, but re-numbered as 110 Beacon ca. 1862 when homes were built on the south side of the street. 110 Beacon is one of seven contiguous houses (104-106-108-110-112-114-116) built ca. 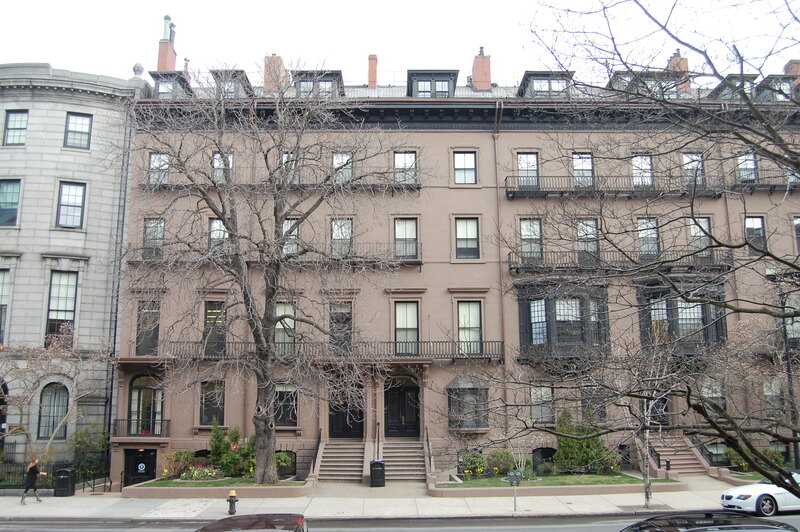 1856 in the same design, all in brownstone with French Academic details, ridge roofs, and a common cornice line (the copper-clad oriels at 106, 108, and 110 Beacon were added in the mid-1880s). 104-106 Beacon, 108-110 Beacon, and 112-114 Beacon are each symmetrical pairs. Bainbridge Bunting’s Houses of Boston’s Back Bay does not attribute 104-116 Beacon to a specific architect. However, in his Building Victorian Boston: The Architecture of Gridley J. F. Bryant, Roger Reed indicates that they were designed by Gridley J. F. Bryant. The land for 110 Beacon was purchased from the Boston and Roxbury Mill Corporation on June 28, 1855, by Frederick W. Lincoln. He and his wife, Amelia (Howard) Lincoln, lived in Canton, where he was agent for the Revere Copper Company and oversaw its manufacturing works there. He later served as the firm’s president. He was the grandson of Paul Revere, and the son of Deborah Revere and Amos Lincoln; his mother had died when he was an infant and had been raised in his grandfather’s home. Click here for an index to the deeds for 110 Beacon. Joseph Swett Coolidge was the son of Tasker Hazard Swett and Elizabeth Boyer Coolidge. He changed his name to Joseph Swett Coolidge in May of 1851, prior to marrying Mary Louisa Coolidge in November of 1851. She was his second cousin (her paternal grandfather, Charles Coolidge, was the brother of Joseph Swett Coolidge’s maternal grandfather, Joseph Coolidge). Joseph S. Coolidge was a shipping merchant in the East India trade, in partnership with his brother-in-law, John Templeman Coolidge, Jr., and Andrew C. Slater. In 1864, Mary Coolidge took their three children to Europe for education. By 1865, Joseph Coolidge had moved to 108 Beacon to live with his in-laws, and by 1866 he had moved to a boarding house at 6 Hamilton Place. In 1871, Mary Coolidge, still in Europe, filed for divorce. She withdrew the petition, moved to Dubuque, Iowa, in 1872, and filed once again in 1873, alleging cruelty and adultery with Mrs. Sarah M. Rice, who kept the boarding house at 6 Hamilton. The suit was dismissed in 1874, but the couple subsequently divorced by mutual agreement. In 1877, Sarah Rice filed suit against Mary Coolidge’s parents and various other parties for defamation of character. By May of 1865, after Joseph Coolidge had moved, 110 Beacon was the home of Edward Darley Boit, Jr., and his wife, Mary Louisa (Cushing) Boit. They had married in June of 1864 and 110 Beacon may have been their first Boston home together. He was an attorney; later would give up the law to become a painter. They moved by 1866 and by 1868 were living at 30 Marlborough with his parents, Edward and Jane Parkinson (Hubbard) Boit. By 1866, 110 Beacon was the home of dry goods commission merchant Samuel Frothingham, Jr., and his wife, Maria Louisa (Whitredge) Frothingham. They previously had lived at 80 Boylston. 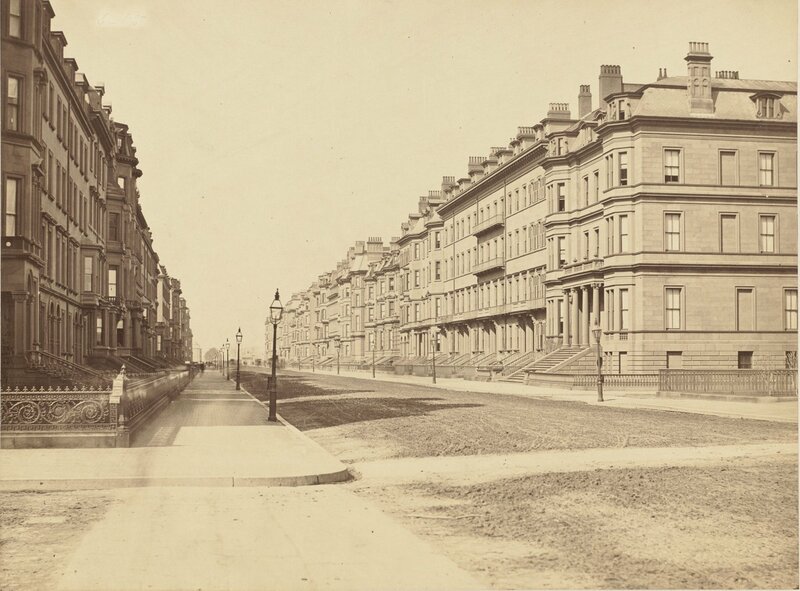 They continued to live at 110 Beacon in 1869, but had moved to 317 Dartmouth by 1870. On January 4, 1870, 110 Beacon was purchased from John Templeman Coolidge by William Jenkins Niles. 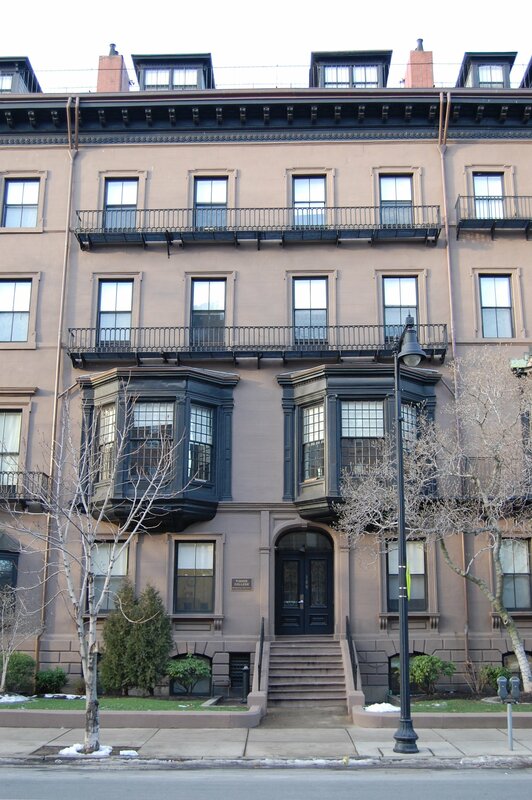 He and his wife, Mary Ann (Hale) Niles, made it their Boston home. They also maintained a home in Arlington, which had been their primary residence in 1869. William Niles was a broker and real estate investor. He and his brother, Thomas Niles, had owned a large livery stable at 33 School Street, which they replaced by the 1860s with a commercial and residential building, the Niles Block. William Niles died in May of 1876. Mary Ann Niles continued to live at 110 Beacon and in Arlington with their unmarried daughters: Emily Hale Niles, Anna Hale Niles, and Sarah Fowle Niles. In the early 1880s, Mrs. Niles and her daughters were joined at 110 Beacon by Thomas Niles, Jr., the son of William Niles’s brother, Thomas. A bachelor, he previously had lived at the Niles Block at 33 School. He was a publisher in partnership with Lewis A. Roberts in the firm of Roberts Brothers (Thomas Niles, Jr., was the half-brother of Lewis Roberts’s first wife, Alice (Niles) Roberts) and is credited with suggesting to Louisa May Alcott that she “write a girls’ book” for his firm, the resulting work being Little Women. Mary Ann Niles died in November of 1891. The Niles sisters and their cousin, Thomas, continued to live at 110 Beacon and in Arlington. Thomas Niles died in May of 1894 while traveling in Europe with Emily, Anna, and Sarah Niles. In his will, he left the bulk of his estate to them, and left smaller amounts or nothing at all to his siblings. After a highly-publicized legal challenge, the will was sustained by the courts. Emily Niles died in September of 1908 and Anna Niles died in June of 1911. On November 16, 1911, Sarah Niles acquired 110 Beacon from her father’s estate. During the 1926-1927 winter season, she was joined at 110 Beacon by investment broker John B. Moulton and his wife, Rosamond S. (Niles) Moulton. Rosamond Moulton was Sarah Niles’s niece, the daughter of George Edward Niles and his wife, Mary L. (Adams) Niles. 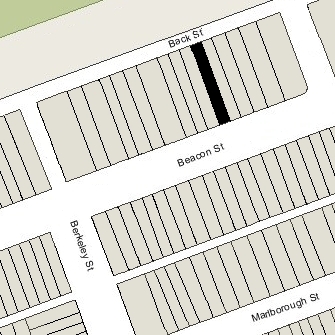 The Moultons’ primary residence was in Hamilton, and it appears that they were living at 110 Beacon to introduce their daughter, Elizabeth, into society during the winter season. Sarah Niles continued to live at 110 Beacon during the 1927-1928 winter season, after which she made her home in Arlington. On January 6, 1928, 110 Beacon was purchased from Sarah Niles by Elizabeth Sturgis (Grew) Beal, the wife of attorney Boylston Adams Beal. They owned and lived at 108 Beacon, next door. In February of 1928, Elizabeth Beal applied for (and subsequently received) permission to remodel the interiors of both houses, including cutting doors through the party wall between the houses to consolidate them into one residence with the address of 108 Beacon. Boylston Beal died in July of 1944. Elizabeth Beal continued to live at 108 Beacon until shortly before her death in May of 1959. On December 3, 1957, 108-110 Beacon was purchased from .Second Bank-State Street Trust Company, conservator of the property of Elizabeth S. Beal, by Fred L. Arata, a retail liquor dealer and real estate investor. He and his wife, Annette Flossie (Crovo) Boggiano Arata, lived in Brighton. On November 9, 1959, 108-110 Beacon were acquired from Fred Arata by M. Henry Garrity. 108-110 Beacon were not listed in the 1958-1960 Lists of Residents and were shown as vacant in the 1958-1961 City Directories. On July 31, 1961, 108-110 Beacon were acquired from M. Henry Garrity by Fisher College. It already owned 112-118 Beacon, and acquired 102-106 Beacon in June of 1962. In August of 1961, Fisher College applied for (and subsequently received) permission to convert 108-110 Beacon into classrooms and other college facilities. As of 2015, Fisher College owned 102-104–106–108-110-112–114–116–118 Beacon, 111 Beacon, 115 Beacon, 131–133 Beacon, 139–141 Beacon, 1 Arlington, and 10-11 Arlington.